When it comes to aggregating news content, two of the most critical elements we consider are the quality and reputation of a media source. Together, these two elements play a significant role in deciding the level of trust and popularity afforded to websites by the people who visit and consume them. With websites in general, a greater volume of traffic will often correlate directly with source popularity and in some cases a higher degree of quality content. Site reputation then naturally follows. Therefore it makes sense to say that, for the most part, a website’s reputation can be benchmarked using visitor traffic volumes. Wouldn’t it be great to be able to filter and sort your news content based on such reputation? Well now you can with our latest News API feature – the ability to search, sort and filter by Alexa ranking. The Alexa ranking system is compiled by alexa.com who analyze the frequency of visits on websites and rank them against each other according to the volume of visits they receive. Alexa’s algorithm is pretty simple – it is calculated by the amount of website traffic generated over the past 3 months. You can check out Alexa’s Top 500 ranked websites. No prizes for guessing which site is top of the pile! Why is it useful in content sourcing? As an aggregator and analyzer of news content, you should be able to sort your sourced content according to a trust rating of some kind. As one of the world’s most respected and trusted ranking systems, Alexa was an obvious choice for us when it came to deciding how to bring this option to you. Put simply, by including specific Alexa ranking parameters in your content search you can significantly increase the chances that your results/stories are coming from reputable, popular and trustworthy sources. This is particularly relevant to News API users who are pushing content to apps and news feeds for their own users to consume. While we check each and every news source for quality standards before adding it to our News API, there is naturally going to be a significant variation in the Alexa ranking of these sources. Sure, you will find plenty of top quality content from websites that perhaps haven’t got the best Alexa ranking, but if you’re pushing stories to an app or news feed you may want to ensure you are gathering stories from the most reliable sources possible. In saying that, you may have a completely different approach and wish to avoid the higher-ranked sources and opt for some lesser-known media outlets whose stories are perhaps performing well on social media. Creating a search that combines a specific Alexa rank range with Social Shares will allow you to do exactly this. Whatever your goal, this new feature adds a whole new dimension to your news content sourcing powers, further adding to the already substantial search options in the News API. How do I search and sort by Alexa ranking? We’ve added Alexa integration to nearly all News API endpoints. For the full list of parameters available check out our documentation. To source stories from websites with a specific range of Alexa ranks, you can use source.rankings.alexa.rank.min: and/or source.rankings.alexa.rank.max. to define your desired range. Let’s take a look at an example where we want to only search for a specific entity mentioned on sources from a defined range of Alexa rankings. We’re going to search for stories that mention Usain Bolt in the past 7 days from sources with an Alexa rank between 1 and 1000. Here’s an example of a retrieved story from our Demo search query with the Alexa rank displayed just below the image and source to the left. Sometimes it’s particularly useful to narrow your search down to popular sources from particular countries. For example, when reporting on a news story from India it might be worthwhile narrowing your search down to sources which are popular in India. You can easily define ranking ranges from specific countries using the source.rankings.alexa.country: parameter. We support ISO 3166-1 alpha-2 country codes. Another strong indicator of the popularity of a source is the number of backlinks or links-in it receives. You can sort_by source.links_in_count to sort your results in order of the most links-in (or backlinks as you may know them) that a site receives. The ability to search and sort news content by Alexa ranking has added a fantastic new dimension to our News API and judging by the feedback we have been receiving from our users, it is one that will be well utilized. 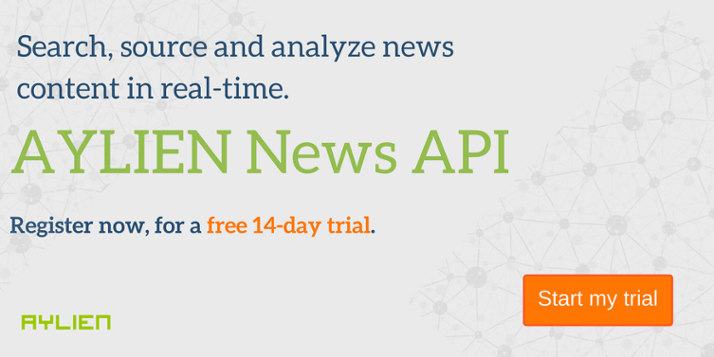 Wanna try our News API for free? We’re offering a no-obligation 14 day trial. Simply head over to our News API Sign Up page or click the image below.